Knee pain is a common reason for people to seek out physiotherapy. Our knees are an important joint in the body which helps keep us upright and moving so it’s understandable that when painful, it can be debilitating, and worrying. If you have knee pain your first thought may be that it is something sinister – i.e. torn meniscus (cartilage) or a ligament injury. However, often, it is simply Patellofemoral Pain Syndrome (PFPS). 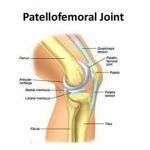 To understand Patellofemoral Pain Syndrome (PFPS) it is important to know what the knee joint consists of – two joints: the tibial-femoral joint and the patellofemoral joint. The tibial-femoral joint is where the femur (thigh bone) and the tibia (shin bone) articulate and work together. The other joint, the patellofemoral joint, is where the patella (kneecap) articulates with the femur via a space called the trochlear groove at the distal end of the femur. While it is a small piece of bone, the patella is vital to a properly functioning knee. It acts as an attachment site for the quadriceps so it can work efficiently during movement. 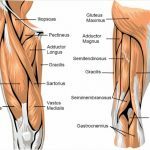 The quadriceps is a group of muscles that distally converge into the quadriceps tendon which attaches on the top of the patella. At the bottom of the patella, there is the patellar tendon, which attaches the patella to the tibia. It is also important to note that on the surface behind the patella, there is a layer of cartilage which enables smooth movement. In a healthy knee, the patella should track upwards smoothly and shift a little laterally (in the outwards direction) along the trochlear groove during flexion and extension of the knee. In someone who has Patellofemoral Pain Syndrome (PFPS), there may be a patellar mal-tracking present – most commonly an excessive gliding laterally when the knee is fully straight. The key thing to note is that Patellofemoral Pain Syndrome (PFPS) is not an acute, trauma-related problem. Rather, it is a gradual onset of muscle imbalances that if not picked up on, leads to pain and dysfunction. Really tight hamstrings (back of the thigh): the hamstrings are responsible for bending the knee. If they are tight, there is a constant flexion force that the patella is counteracting even when the knee is straight. Imbalance of VMO:VL firing ratio: the VMO (vastus medialis oblique) is a collection of muscle fibers of your quads on the inner part of your thigh and attaches onto the inner part of the patella. The VL (vastus lateralis) is the outer part of your quads and attaches onto the outer part of the patella. Ideally, the firing ratio when squeezing your quad, is equal, if not the VMO firing just before the VL does. If there is excessive firing of one over the other, that signifies an imbalance, and thus influences the patella to move more to that direction. Most commonly, it is the VL that takes over excessively, and the VMO is too weak to counteract the strength of those fibers. Tight iliotibial band (IT Band): this is that thick band that runs down the outer part of your thigh, starting from the hip and inserting into the outer edge of the knee. This is most commonly tight in runners and cyclists. Some of the distal fibers of the IT Band converge with the distal fibers of the VL and thus can also influence patellar tracking and cause that excessive lateral shift. Tight and weak quads overall: yes… they can be both at the same time! Tightness stems from trigger points (or knots) in the muscle fibers which doesn’t allow the muscle to stretch properly and thus cannot appropriately fire, which inhibits its ability to work and strengthen efficiently. Fallen arches or overpronation: sometimes you are born with this. Fallen arches causes an increased pressure on the inner aspect of the knee and inhibiting proper patellar tracking. As you can see, there are numerous causes that can contribute to Patellofemoral Pain Syndrome (PFPS) and knee pain in general, and the list above isn’t exhaustive. Your physiotherapist will check these aspects in your initial assessment and treat accordingly through the use of hands-on myofascial release of tight muscles, dry needling, joint mobilizations to the patella and stretching and strengthening of what muscles are found to be tight and weak. You may be advised initially to modify your activity levels or stop altogether until symptoms settle. Once the imbalance is taken care of, and your pain has drastically reduced or ceased completely, return to the desired sport/activity levels will be commenced safely as per your physiotherapist’s guidance.